Agriculture is the traditional backbone of the Chocolá economy yet during the 20th century in the hands of large corporate farmers, thje region around Chocolá evolved into a mono-culture of coffee. Today, the giant Chocolá Coffee Finca corporation is gone but the mono-culture remains and yields only paltry returns for the small farmers who inherited the land during the land reform movement in the 20th century. For decades they have been vulnerable to crop brokers who offer only the lowest prices. Additionally, Chocolá is lower in altitude than is optimal for production of high quality coffee and so farmers barely subsist on the crops they raise. On the other hand, Chocolá is at an ideal elevation for other crops including banana, pineapple, cacao, bamboo, nut trees and a great variety of vegetables. 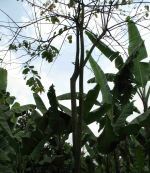 The coffee mono-culture has all but destroyed plant and tree diversity. Consequently, programs to help farmers learn more about the advantages to the land and their family income of bio-diversity are being developed in conjunction with Guatemalan governmental agencies, our own team members and the Rainforest Alliance. Additionally, Semillas Para El Futuro is funding the establishment of a modest Chocolá Demonstration Farm in conjunction with local farmers, governmental agencies and other NGO’s, which will become an educational and demonstration center for the region to help encourage more dio-diversity in the areas agricultural industry. Semillas is also working with the local coffee cooperative to convert waste coffee seed hulls from the coffee plant to organic fertilizer (obono) that can be used locally or sold for income to the community. Additionally, the process will eliminate environmental pollution of the Chocolá River from waste that has been dumped along the banks and into the river itself. And agreements are also being sought with the federal government and the Rainforest Alliance to provide expert agronomists and other technicians to create demonstration programs aimed at the re-introduction of cacao, nut and other fruiting trees into the agricultural pallet of the region. The demonstration farm will provide technical training to farmers throughout the region, introduce them new methods and plant varieties within the framework of organic farming. From the time of the Maya to modern times, people in the area of Chocolá have made use of hydro power. Indeed, water works have been found within the homes of Maya royalty that apparently delivered fresh water and carried away waste and the German coffee Beneficio used water wheels to generate electricity, power a saw mill, machine shop and the coffee Beneficio itself. The potential for continued use of water power at Chocola to help make the community energy self-sufficient.